Encouraging wildlife into your garden adds extra colour, sounds, movement and interest to them, as an added bonus many of your new visitors will also help you keep the garden pests under control. As natural habitats are increasingly under threat through out the world, our very own back gardens are becoming increasingly important for wildlife, indeed they are now commonly regarded as our most important nature reserves! Only those with large gardens will be able to encompass all these points, but the more the merrier! The most important thing that you can do to encourage wildlife is to build a pond. A very simple pond that can be installed in less than an hour using an old baby bath or other water tight container. If a pond is not possible, a boost for local wildlife is given by providing a source of fresh water. You may well discover that local birds will bathe in the water, insects and birds will drink and a ground level water source will attract hedgehogs and their like. Plant or encourage trees, shrubs and hedges to provide shelter, and food supplies, for birds and insects and other mini beasts. Blackthorn, hawthorn, crab apple, holly and field maple are a few examples of particularly wildlife friendly native species. Your enhanced vegetation may also provide enough shelter to a new habitat, so diversifying wildlife. On a similar note, covering any bare areas with climbers such as honeysuckle, ivy or hops will also add to the richness and diversity of habitats for wildlife. A log garden will further add to the diversity. This is as simple as collecting old logs, piling it up and leaving it in a quiet corner of your garden. Ideally you should use logs of varying thickness and type, and also occasionally adding new material so that you may offer food at varying stages of decay. A log pile will attract a huge variety of insects, spiders and fungi. It may also provide a warm safe place to hibernate for toads, hedgehogs, mice and voles. Perhaps lesser known are the large variety of insects homes that can be created. If you have already created a log pile then that is the first, but you can also create homes for minibeasts, bees, wasps, beetles, spiders and ladybirds by drilling holes in a log, tying canes or similar tubes together and putting on the ground or hanging on trees or fences, filling a plant pot with dead leaves and turning it upside down or by putting holes in a bucket or other container, filling it with a mix of woodchips and soil and burying it. Many of these solutions are also available to buy and there are many more possibilities, basically anywhere that provides shelter will attract wildlife. This includes nooks and crannies like those provided by dry stone walls which should be used in preference of cemented walls where possible. To help the nectar lovers stick around, try to use a good variety of plants that flower at different times of year. Early flowering plants include cowslip, forget-me-not and primrose; whilst summer flowering plants include buddleia, marigolds and lady’s smock; to extend the season even further also include late flowering plants such as lavender, fuchsia and ice plants. Feed the birds. Regardless of which birds you currently have visiting your garden or even ones which you would like to visit your garden, you have a huge choice of foods and feeders available. In order to provide a good selection of feeding choices for birds you can offer nuts, various seeds, left over food, suet, fruit and a whole host of other things. This variety is almost matched by the array of feeders on offer, many aimed at specific foods. Once you have selected your menu put food at varying heights including ground level (unless you have problems with rats), sit back and watch how it goes. 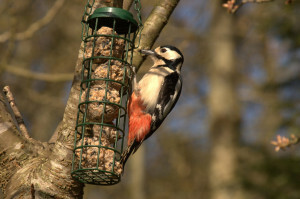 Birds may take a couple of days to become accustomed to the feeders or they may be on them before you get back inside. Keep an eye on which seems to be favourites with the different species, experiment and enjoy watching your visitors. Feed the mammals. Well, we have fed the birds and shouldn’t really leave the mammals feeling neglected. 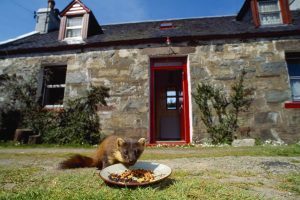 If you already know which mammals are visiting your garden then you have a head start and can put out food accordingly. Whether you are visited by badgers, foxes, hedgehogs, squirrels, bats, mice, deer or other mammals; there are ways of attracting them to your garden and helping their survival. A variety of foods such as pet food, nut and raisins and even peanut butter can soon begin to attract regular visitors. Planting night scented flowers such as honeysuckle can also help as it attracts insects to your garden which bats can feed on. Provide wildlife with homes. If you are keen you have scope to build a whole mini metropolis for you wildlife. You can choose from a whole variety of habitations from providing bird boxes, bat boxes, hedgehog boxes (hibernaculum), homes for mice and voles and butterfly boxes, all of which are commercially available or can be built yourselves. The final thing which we are going to cover in the encouragement section is the compost heap. As well as helping your plants when used in your garden, a compost heap can provide habitat for a huge array of wildlife from bacteria and worms through to toads and even hedgehogs. Most garden waste and many kitchen scraps such as tea bags, fruit and vegetable peelings can be added to your compost heap. Meats, cooked food, coal and ash should be avoided. Clear up any household rubbish. Abandoned bottles are especially dangerous for small mammals and beetles as are drinks cans. Weedkillers and pesticides can be as harmful to wildlife as they are to weeds and pests. If it must be used then great care must be taken and ideally, natural alternatives should be used. If you have followed the steps to encourage wildlife, then you may be fortunate to find that you no longer need them at all! Take great care with any netting used in your garden. Make sure that they are firmly attached and tight to reduce the risk of birds and animals cannot get tangled up in them. Incidentally this also applies to many of the fat ball products that can be purchased for birds and often come in netting – this should be removed before usage. Do not use peat in your garden as this habitat has seen a huge decline and is now a highly endangered habitat. Where possible use native species in your garden and try to ensure that these are of UK origin and not imported. Collect rainwater for use in your garden, either for watering plants or for topping up your pond. The list above shows just a sample of some of the many ways in which you can help you local wildlife. Whilst a rule of thumb is the more the better, trying to cram too much in can be somewhat negative, for example butterfly houses are not ideally sited next door to a bird box, especially if that box is occupied by an insect eater such as a flycatcher. Used with some care the above list may help to enrich the available habitat in your garden and really help you do your bit in aiding and encouraging your local wildlife.